*Italy’s political right is organizing this demonstration “in support of the family” – that is, the right’s (and the Catholic Church’s) idea of the “traditional” family. If it’s so traditional, why can’t they find Italian words to describe their demonstration? 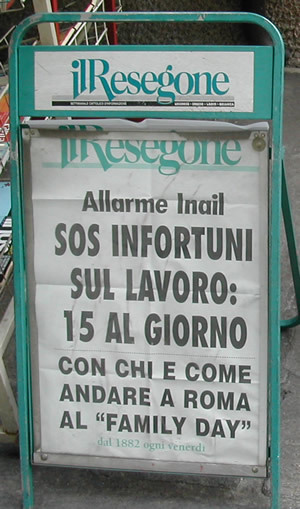 This little local paper Il Resegone (named for the local mountain) evidently supports the idea. This entry was posted in Italian culture, Italian language and tagged Italian culture, Italian language, Italian newspapers on April 5, 2007 by Deirdre Straughan.